Vitality C is a pleasant tasting, non-acidic, high potency Vitamin C powder enhanced with a GMS Ribose Complex. 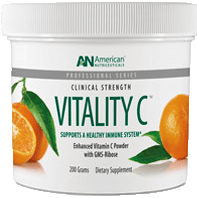 It contains 4 GRAMS (4000mg) of Vitamin C per teaspoon that can be taken without stomach upset, gas or diarrhea that usually comes with high doses of Vitamin C. Vitality C utilizes four unique uptake pathways for superior absorption. Vitality C is a pleasant tasting, non-acidic, high potency Vitamin C powder enhanced with a GMS Ribose Complex. It contains 4 GRAMS (4000mg) of Vitamin C per teaspoon that can be taken without stomach upset, gas or diarrhea that usually comes with high doses of Vitamin C.
WHAT MAKES VITALITY C UNIQUE? The vitamin C in Vitality C is in the form of L-Ascorbate C Crystals with FASM. This form contains a unique, firmly attached sodium molecule and is buffered at a non-acidic ph, making it less likely to cause gastrointestinal discomfort that often comes with taking large doses of vitamin C. In addition, added GMS-Ribose (glycine methyl sulfone ribose), a patented proprietary blend of methylated glycine, supports bioavailability. Easy to take, Vitality C comes in a pleasant-tasting powder that mixes easily into juice or water. WHY SHOULD I CONSIDER USING VITALITY C? Vitality C utilizes four unique uptake pathways for superior absorption. 1.) Glucose Pathway - the common pathway for Vitamin C uptake. Because many nutrients utilize this pathway, it appears that Vitality C does not have to “wait in line” to be absorbed and can use one of the other pathways if needed. 2.) Sodium Pathway - The fully attached elemental sodium molecule is another pathway utilized for absorption. Since it does not break down in the gut, there is no stomach upset (as most Vitamin C products will do at this dosage). Note this differs from common table salt in that it is not combined with chloride, the sodium salt most associated with hypertension. 4.) Bioavailable Organic Sulphur (BOT)) - The BOT enhancement supports healthy connective tissues, but also creates more pliable and permeable cells. When water and nutrients flow freely into cells, and wastes and toxins flow out properly, our bodies are able to eliminate toxins more efficiently and absorb nutrients more readily. Essential for normal growth and development, vitamin C is a water-soluble nutrient that functions as a cofactor in several enzymatic reactions. It's necessary for collagen synthesis, making it important for the health of skin, tendons, ligaments and blood vessels. It's also necessary to help maintain healthy cartilage, bones and teeth and may aid the body's natural recovery processes. In addition, vitamin C is an antioxidant and may help protect cells from free-radical damage. By utilizing these four unique uptake pathways, it maximizes absorption and bypasses the gut reaction that would normally occur when taking high levels of vitamin C. This dosage allows for maximum support to the immune system and to aid detoxification. Vitamin C is effective, safe and beneficial vitamins for healthy immune support. Vitality C is neutral tasting, can be easily mixed with any liquid and safe for all ages. Adults - 1 to 4 teaspoons daily in juice or purified water. For imbalances - 1 tsp every 1 to 6 hours. Children under 10 years of age - 1/4 tsp per year of age daily. Unique synergistic formula permits consuming mega doses of Vitamin C with minimal gas or diarrhea. Individuals on a sodium restricted diet may wish to consult with their Healthcare Professional. If you are pregnant or nursing, please consult your healthcare professional before using this product. Each serving contains 4 grams (4,000mg) of the most bio-available Vitamin C. As our Vitamin C is an all natural product, color may vary and/or a slight browning may occur which does not affect potency or taste. L-Ascorbate C crystals with FASM, a uniquely Fully Attached Sodium Molecule, are buffered at a non-acidic, neutral pH. 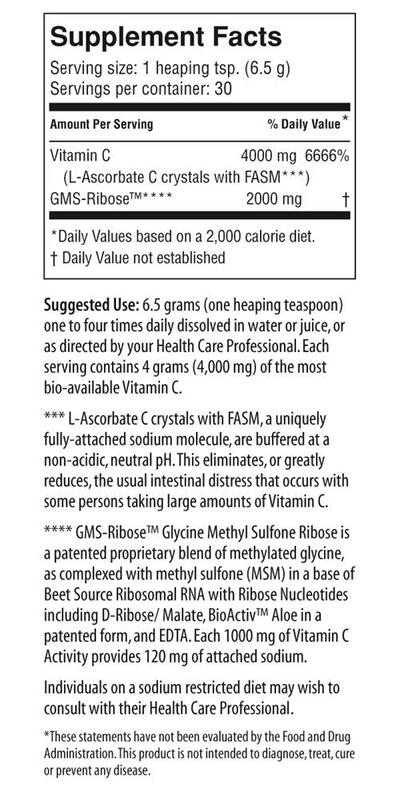 This eliminates, or greatly reduces, the usual intestinal distress that occurs with some persons taking large amounts of Vitamin C.
GMS-Ribose™ Glycine Methyl Sulfone Ribsoe is a patented proprietary blend of methylated glycine as complexed with methyl sulfone (MSM) in a base of Beet Source Ribosomal RNA with Ribose Nucleotides including D-Ribose/BioActiv™ Aloe in a patented form, and EDTA. Each 1000 mg of Vitamin C activity provides 120 mg of attached sodium. Preliminary double blind human trials on one or more of the ingredients GMS Riobose™/BioActiv™ Aloe taken with Vitamin C have shown to increase plasma levels up to 200% of subjects on a placebo. Is Vitality C made in China?